The keyboard has 72 keys: 36 representing the top and 28 the bottom sections of Chinese characters, plus eight printing keys. Pressing a top and a bottom key brings the type roller into position to print a “unit” of eight possible combinations of the basic sectionsâ€”eight different words. The printing mechanism consists of six cylinders, each having six type rollers that contain 7,000 complete characters and over 1,400 components. Additional words up to a theoretical 90,000 are formed by typing combinations, such as sun+moon, which means “clear.” All the characters are duplicated on the six “viewing” cylinders. Designed for Chinese, the machine can also be used for writing English, Russian, and Japanese by pressing keys that shift into printing position type rollers of faces of the desired language. It types vertical columns, so that when English is used, the typescript has to be turned sideways. The description of this strikes me as incomplete or confused. It characterizes the system as splitting the hanzi characters into “top” and “bottom”, but in reality a character’s component radicals (collections of strokes that categorize or provide meaning to a character) can be arranged in any of a few dozen layouts. Add to this the fact that many radicals change shape and size when placed elsewhere, and this typewriter might merely generate a funny sort of shorthand for proper typesetters (which was the intent of the original English typewriters, to be fair). I believe that the bit about the eight different sections was trying to describe this, but got confused about the roles of radicals and complete characters. Still, I’d love to see what the output really looks like! In order to understand the genius of Dr. Lin’s method of organizing Chinese characters, you ned to refer to the frontpiece of his Chinese dictionary which was not published until the 1970’s. Both the Chinese communists and the American military did not want to see this typewriter put into production. The machine itself was made obsolete by electronic typewriters. Dr. Lin was a person of rare courage. He spent his own money to bring this machine into existence. It was his gift to china and the world. “Mingkwai” typewriter, it is really cool invention. I wonder where people can by this type of typewriter. Thanks for your interest in the MIngkwai. 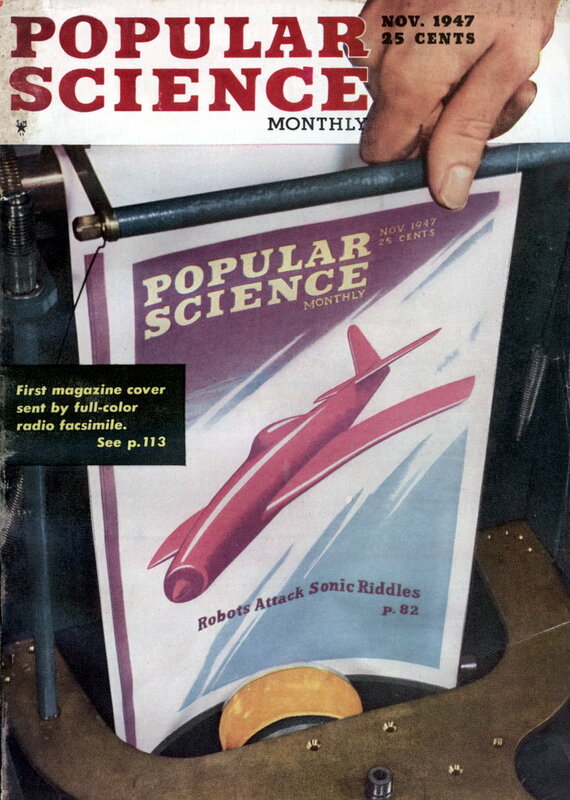 My father’s and his engineering firm actually built the prototype. Dr. Lin held the patent. The patent number is in my Wikipedia article. The Minghwai typewriter actually did require the upper right and lower left of the character to be indicated by the first two keystrokes, after which one picked the character one wanted from the choices presented in the typewriter’s window. Thus, it could be considered the ancestor of today’s input methods. 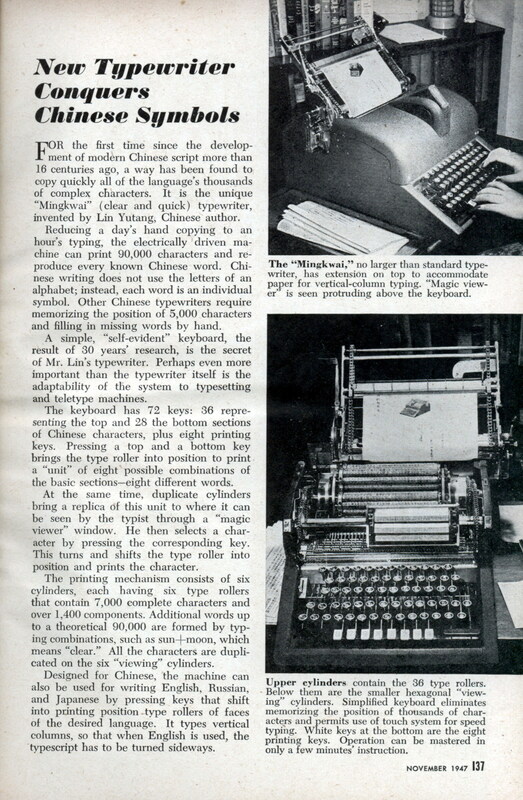 It may also be noted that research sponsored by the American military involved using a Flexowriter modified to correspond to this typewriter for input of Chinese for computer translation. Lin Yutang did sustain financial losses in trying to put the typewriter into production; I recall reading a short biographical account which gave reasonable explanations for this. The Modern Mechanix article on the MIngKwai was apparently written in 1947 There’s no author byline. The typewriter itself sat in Dr. Lin’s living room for some time much to his wife’s dismay. It was a prototype, sort of like the Tucker car. If it had gone into production in the 1950’s as an electric typewriter it would have been a first for electrics in offices and publishing houses. And it might have been improved. Looking at the patents, as a non-engineer, Dr, Lin seems to have thought of everything. The remaining reports in my Dad’s files responded in detail to Dr. Lin’s requirements. Each and every part had to be made by skilled craftsman like a handcrafted watch. Dr.Lin’s daughter Lin Tai Yi did know how to type on it. She was an editor at Reader’s Digest. Her biography of her father was published as a condensed book in its Australian edition. She passed away several years ago and Dr. Lin’s scroll and art collection was donated to the Metropolitan Museum of art in New York city. My own feeling is that she and perhaps her sister persuaded Dr. Lin to publish his dictionary as a way to take his mind off a family tragedy.